The reason I built this incubator, was that I had a few spare parts for a hovabator incubator that I got in a package deal, and thought Id try to make one that worked better than a hovabators (less temperature fluctuation). I found the spare hovabator expandable ring fit perfectly inside a standard fish box, so I found one of those in the garage. And used salvage aluminum and egg grate that I found for a total of a $30 incubator. 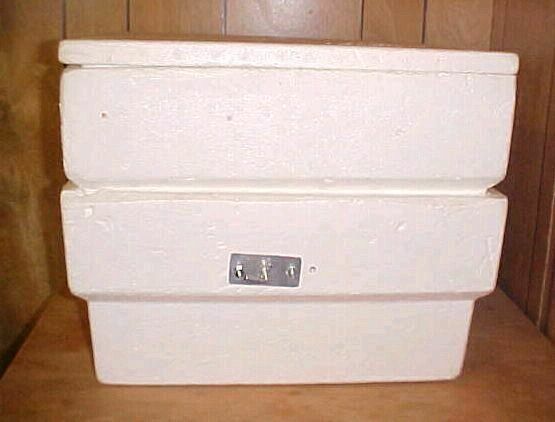 As you can see in the picture below, I used an aluminum plate that I cut to fit inside the fish box. I bolted some aluminum square tubing to it, which is what holds the egg crate to allow for air circulation underneath the egg containers. This can also be easily removed to fit a larger incubator (more on that later). The aluminum plate helps radiate the heat from the heat element. Cut and installed egg grate to fit. "Egg grate" is what is used in industrial flourescent light fixtures to help diffuse the light. 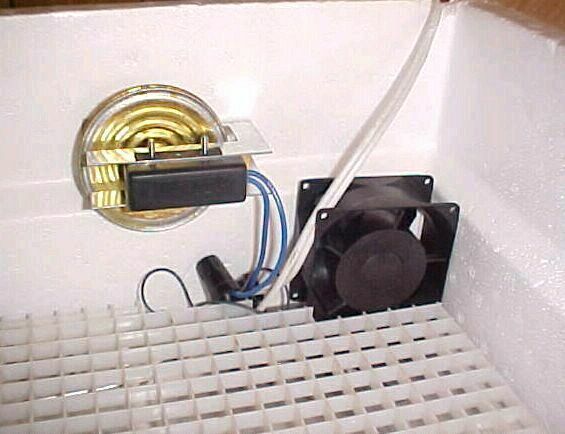 I mounted the thermostat to the side of the fish box. I drilled 3 holes for the holding bolts and the adjustment doomherhicky that comes with the thermostat assembly. I cut the egg grate to fit so that it would hold the computer fan in place. 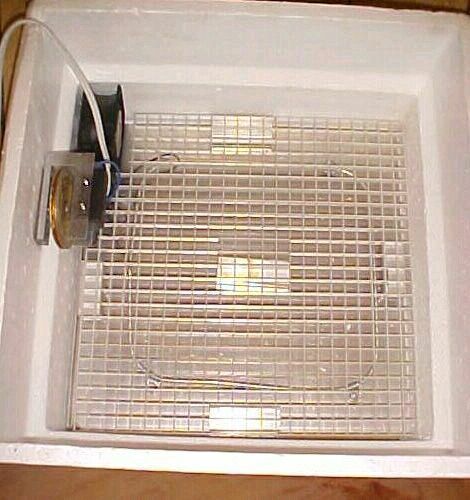 You can see how the computer fan will circulate the air, and keep all the air the same temperature, under and around the egg boxes (not pictured). I wired it independently of the heat element, because the heat element and aluminium will continue to radiate heat unevenly after the power is cut to them (via the thermostat). 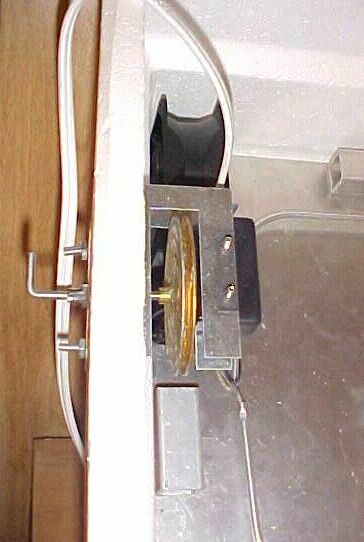 The fan runs continuously to circulate the air. 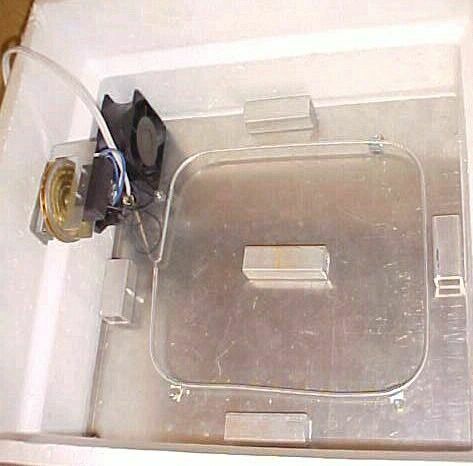 Side view of the finished incubator, notice the retaining ring. This incubator works very well, and can hold 4 gladware egg containers (pictures of that to come). It holds stable temperatures better than a commercial hovabator. It worked so well in fact, that I lent it with a female blood python we used to have at the zoo that was at a breeding loan with the only albino blood python in Canada. Unfortunately, no eggs were produced to test this incubator out on pythons. With this assembly, I can easily and quickly move everything to a larger stryo box or something else, like an old fridge. Pictures of that to come soon. 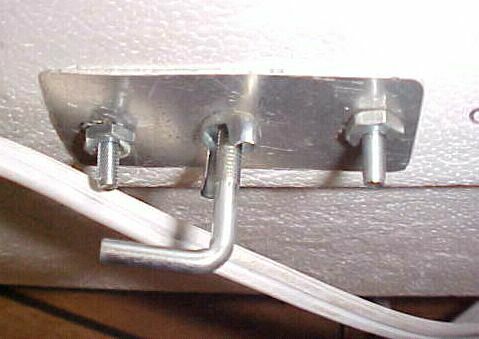 If you do have a hovabators with a fan, you can actually just flip the lid upside down, and place it into the bottom of an old refrigerator.I did this, and drilled a hole in the refrigerator so that it wouldnt build pressure when it closed. I used the racks to hold egg boxes, and it works very well. This kind of incubator works very well for colubrids. However, I've since switched over to an easier to build and more temperature stable wet system system. How to, to be added shortly.